Retrospectives after a sprint can be fun, challenging and at times trying. It is not a finger pointing session but a chance to reflect on what was good or bad about the last sprint. All team members should participate if they aren’t this would be the first issue to address. One way to get participation is by having one member start by sharing a good experience.The group then takes turn discussing this experience. Often other good and bad experiences come from that discussion. During the discussion a ball can be used to toss to the person that is talking. The ball becomes the signal that a member is talking and should not be interrupted. When the member is done they toss the ball to another member. This keeps the session moving, gives everyone a chance to talk and it can be fun. All good and bad items should be put on a white board. Each bad experience should have a plan to resolve. This is not to say that every bad experience can be resolved in the next Sprint, it may take a few Sprints. One bad experience teams encounter is getting the business involved and/or getting the business to address User Story questions in a timely manner. If you read Lisa Crispin’s article “Experimenting” she gives a great example of how her team addressed a bad experience using faces to rate User Stories. A happy face given to User Stories that were documented well and the team was able to assign to a Sprint. A sad face was given to User Stores that were badly documented and/or waiting on the business for information. The User Story face rating was shared with the business and it was known going into a Sprint the business information needed and that if it was not obtained the Story would not be done. Read the article it is very interesting. I think we should add to the Product Back Log work item a field that can be used for face rating. It can be done! Agile, Manage &amp; Test–Stickyminds launches TechWell for the test community. Sticky minds.com has launched a new site called TechWell for the Agile, Manage and Test communities. You can interact with others through blogs, forums and groups. Access videos, podcasts, articles, and more all pertaining to testing. With todays changes in the Software Industry happening quickly testers are facing challenges in the skills they need. The future is Agile with a Scrum methodology and framework. Testers need to be ready and it is going to happen quickly, in fact it has started already. I recommend checking out TechWell and getting the scoop from your peers in the community. Click on TechWell to check out. Objectsharp’s Steve Syfuhs the Canadian Developer Security MVP is being interviewed by Jonathan Rozenblit a Microsoft evangelist on the basics of securing applications. Quality Center has been the popular kid on the block over the years. Since Microsoft Test Manager came out in April 2010 it has and is giving QC a run for it’s money. Many companies are wanting to convert over to Microsoft TFS 2010 from Quality Center but are not sure how and do not want to lose existing artefacts. SELA a Microsoft Gold Partner have created Scrat that will let you migrate full HP Quality Center projects into TFS2010 in days. Requirements, Bugs, Test Cases, Attachments and Links between items plus their interrelationship links can all be migrated to TFS 2010. Scrat is completely configurable to migrate what you want and need. there is one place that stores all the project artefacts and anyone on the team can see them, how organized and commutative is that. Note: the above are not direct quotes they are however truly what I am hearing testers saying. Check out Scrat and if you need help give us a call. Microsoft announces unlimited Load Testing for Visual Studio 2010 Ultimate with MSDN Subscribers. Read up about this huge deal and download today the VS2010 Load Test Feature Pack then start your load testing. If you need help call Object Sharp we can help you with your Load Testing. There are concept video’s covering testing topics. Research and Evidence speaks for itself. If you want to find out about Microsoft Testing tools this is the place. MTM 2010 has opened up the world of manual testing with data-driven and fast forward capabilities. Plus, they have taken extra steps to ensure your successful here is an example of one. In this example if I remove the executable from my desktop and pin it to my start menu the test will execute successfully. If I then remove it from my start menu and pin it to my task bar the test again executes successfully. In addition the test actions is opening the executable not following the human interaction of double-clicking. This makes your test even less subset able to failure. Note that these types of failures are not application issues and therefore we’d really like to not have to deal with them. Thanks to Microsoft there is less chance of this slowing our testing down due to setup issues. The Software Testing Club puts out a magazine call “The Testing Planet”. It is a must to read you can either buy a subscription to the magazine or download the PDF version for free. The magazine is created by “testers” with articles about testing by testers. The new issue just came out – check it out. You can follow the club on Linked IN, Facebook and Twitter. Have you every been in a situation where you have had to execute a test that you did not create or you were not involved in the project at the being. You could use a walk through or in the least more information on what this test is about, how each step will interact with the application, it might be a bug your retesting. It could even be an exploratory test that someone had not created a true test case with steps. 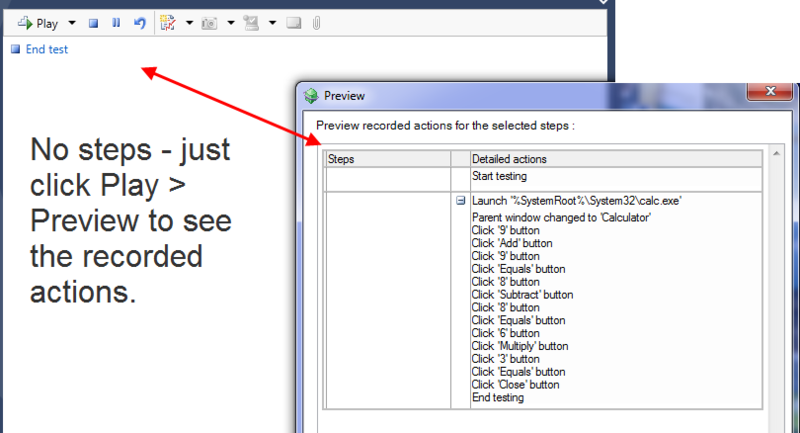 Test Manager during run time has a handy feature that lets you preview a step or steps. 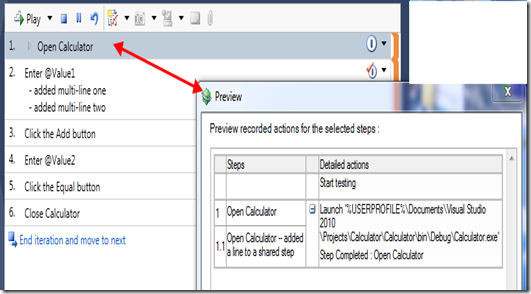 Here is an example of selecting a shared step for preview. Here is an example of a step with multiple lines (see blog: Microsoft Test Manager–test case multi steps tool) and a parameter. Last an example of a exploratory test case – you got to like this one.